The Milner’s Chapel/Emmaline Stutts Cemetery is beside Lauderdale Co. Rd. #8 near Greenhill, AL. 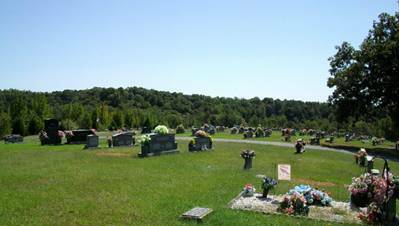 To reach the cemetery, travel from Cox Creek Parkway in Florence, AL north on Lauderdale Co. Rd. #47 traveling through St. Florian, AL to Co. Rd. #34, turning left. Co. Rd. #34 is at the Gray’s Chapel Free Will Baptist Church. After turning left onto Co. Rd. #34, travel approximately 3 miles to Co. Rd. #8 Turn right onto Co. Rd. #8 & the cemetery is on the hill in front of Milner’s Chapel United Methodist Church. This cemetery has a number of very old graves. The earliest known birth date is that of Susannah Stutts being born in 1789. Enumerated by David & Martha Montgomery on December 31, 2011. Abernathy, Lois E.; b. 01 Mar 1936, d. 19 Mar 1937, son of Mr. & Mrs. Willie B.
Clemons, Bennie Sue; b. & d. 15 Feb 1944, daughter of B.D. & D.M. Clemons, Hazel D.; b. 18 Oct 1917, d. 18 Apr 1919, daughter of W.T. & A.L. Coker, Grady Clenton; b. 27 Feb 1940, d. 08 May 1940, son of Eula Mae & Edward L.
Foshee, Lorine (Garner); b. 19 May 1912, d. 07 Mar 1938, wife of E.C. Friar, Jean Kennedy; b. 05 Mar 1930, d. 28 Jun 2008, wife of James E.
Fuller, Paul Stephen Sr; b. 27 Oct 1946, d. 30 Apr 2013, husband of Glenna M.
Garner, Druew; b. 04 Jan 1916, d. 25 Jan 1916, son of W.W. & k.l. Gist, Luceal; b. 12 Sep 1922, d. 15 Aug 1922, daughter of W.H. & M.E. Ham, infant; b. & d. 07 Dec 1905, infant of D.L. & W.N. Hill, Felix; b. 20 Aug 1901, d. 22 Apr 1924, son of Mary Jimmie E.
Hill, John G.; b. 02 Jan 1826, d. 17 Apr 1888, husband of P.L. Hill, Lizzie; b. 06 Nov 1865, d. 09 Feb 1936, wife of John Q.
Hill, Mary C.; b. 25 Oct 1894, d. 10 Jun 1930, wife of W.L. Hill, Mary; b. 14 Apr 1875, d. 28 Dec 1912, wife of Jimmie E.
Hill, Price E.; b. 02 Mar 1894, d. 13 Dec 1917, Camp Wheeler GA CO. MG 123 Inf. Hine, Elmer; b. 24 Apr 1931, d. 13 Feb 1936, son of O.L. & A.K. Hine, Sula D.; b. 10 Apr 1878, d. 14 Sep 1924, wife of Charles F.
Hines, Ruby Lee; b. 04 Feb 1931, d. 15 Dec 1985, wife of Robert J.R.
Kennedy, Kim Howell; b. 15 Jan 1953, d. 16 Jan 1953, son of Mr. & Mrs. H.D. Ledbetter, Kiyleen Key; b. 10 Jul 1985, d. 29 May 1989, daughter of Walter H. Jr.
McClanahan, Arthur C.; b. 01 Aug 1893, d. 13 Oct 1926, Pvt. Co. “K” 38th Inf. McKinney, infant; 10 May 1930, daughter of J.I. & M.F. McLaughlin, Gene Howell; b. 01 Oct 1931, d. 01 Nov 1931, son of Nelve P. & Helen R.
McLaughlin, Henry L.; b. 17 May 1918, d. 17 Jun 1919, son of J.O. & H.I. McMurtrey, Irene (Richardson); b. 25 Sep 1909, d. 19 Aug 1940, wife of E.G. McMurtrey, John Spinks; b. 12 Nov 1844, d. 19?? Morrison, Ann Nora; b. 11 Jun 1928, d. 13 Mar 1929, daughter of Mr. & Mrs. W.E. Myrick, infant; b. 13 May 1898, d. 01 Jun 1898, daughter of Leonard C. & Mary R.
Myrick, Sallie (Rogers); b. 17 Sep 1891, d. 25 Feb 1914, wife of W.L. Purser, Ruby Geneva; b. 30 Nov 1927, d. 26 Oct 2013, wife of George V.
Quillen, Maudie Inez (Canerday); b. 12 Aug 1898, d. 12 Jul 1961, wife of Floyd B.
Richardson, Charley E.; b. 07 Jul 1901, d. 22 Dec 1905, son of James R. & Jinnie L.
Richardson, Eva D. (Phillips); b. 30 Jul 1884, d. 24 Jan 1903, daughter of W.B. & M.E. Richardson, Fannie L.; b. 11 Jul 1898, d. 04 Apr 1901, daughter of James R. & Jinnie L.
Riley, E.L. Jr.; b. 28 Oct 1928, d. 25 Feb 2015, husband of Christine (Clemmons), US Air Force Staff Sgt. Riley, George L.; b. 20 Jan 1900, d. 14 Oct 1900, son of W.A. & Nannie J.
Riley, Ola L.; b. 14 Nov 1896, d. 09 Jul 1900, daughter of W.A. & Nannie J.
Stutts, infant; b. & d. 18 Aug 1864, son of J.R. & S.C.
Stutts, James W.; b. 17 Sep 1862, d. 19 Dec 1862, son of J.R. & S.C.
Stutts, L.W. ; b. 24 Nov 1824, d. 12 Sep 188?, husband of P.I. Stutts, Margaret (Jones); b. 20 Aug 1839, d. 29 May 1914, wife of John R.
Stutts, Mary P. (Hill); b. 19 Feb 1866, d. 23 Aug 1913, wife of Ben F.
Stutts, R.C.E. ; b. 07 Dec 1872, d. 03 Oct 1874, son of W.M. & C.M. Stutts, Susan C. (Roberson); b. 1835, d. 1867, wife of John R.
Williams, Billy Ray; 14 Sep 1936, son of R.L. & L.C.